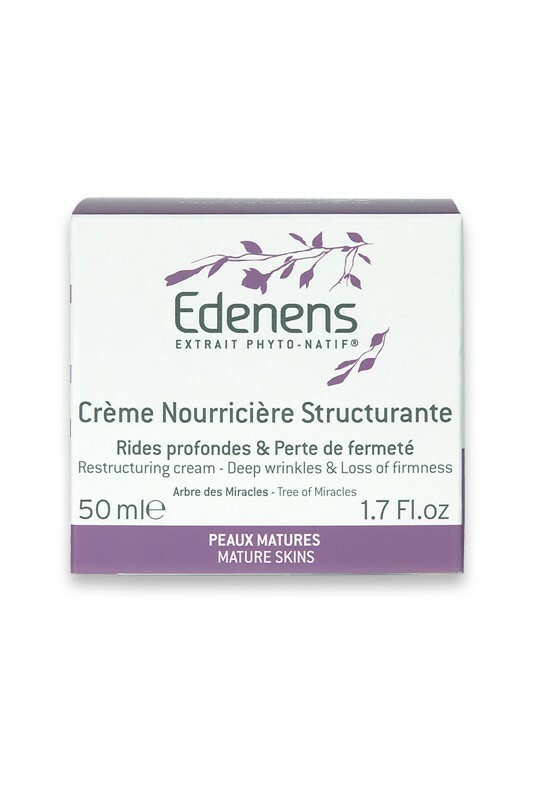 Edenens' Cream Nourricière Structurante is an exceptional anti-wrinkle skincare with global anti-age action for mature skin. Its melting texture leaves your face smooth and redefined. The Tree of Miracles protects your skin from pollution and outer agression, while Flowers of Kimalao fill deep wrinkles and redensify the epidermis. Hyaluronic Acid maintains hydration* and firmness by stimulating collagen synthesis. Phyto-Native Extract feeds skin cells with essential nutriments : peptids, amino acids, minerals. 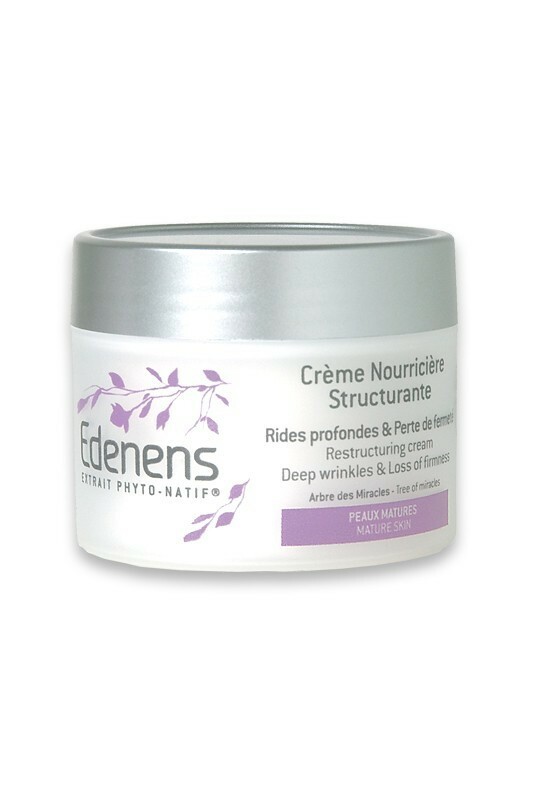 After one month of using the Anti-Wrinkle Skincare "Crème Nourricière Restructurante" Edenens, your skin is smoother and firmer, the face shape is well defined and the depth of wrinkles is significantly reduced. Dermatologist tested. Non comedogenic. * Long lasting moisturization of superficial layers of the skin. Apply day and night Edenens Restructuring Anti Wrinkle Cream on perfectly cleaned face and neck. Aqua, Caprylic/Capric Triglyceride, Isostearyl Isostearate, Helianthus Annuus Seed Oil, PEG-8 Beeswax, Stearic Acid, Cetyl Alcohol, Glycerin, Aluminum Starch Octenylsuccinate, Glyceryl Stearate, HDI/Trimethylol Hexyllactone Crosspolymer, Hydrogenated Palm Kernel Glycerides, Alcohol, Soluble Collagen, Hydrolyzed Soy Protein, Ceteth-20, Xanthan Gum, Benzyl Alcohol, Fagus Sylvatica Bud Extract, Parfum, Tocopherol, Steareth-20, Sodium Dehydroacetate, Hydrolyzed Hyaluronic Acid, Hydrogenated Palm Glycerides, Onopordum Acanthium Flower/Leaf/Stem Extract, Spilanthes Acmellla Flower Extract, Silica, Dehydroacetic Acid, Sodium Hydroxide, Linalool, Phenoxyethanol, Commiphora Mukul Resin Extract, Benzyl Salicylate, Hydroxyisohexyl 3-Cyclohexene Carboxaldehyde, Hexyl Cinnamal, Dextrin, Moringa Pterygosperma Seed Extract, Benzyl Benzoate, Limonene, Benzoic Acid, Butylphenyl Methylproponial, Alpha-Isomethyl Ionone, Coumarin, Hydroxycitronellal, Sorbic Acid.